The game consists of 32 playing cards each with an element. The elements used are 1-20 plus 12 others from across the periodic table. 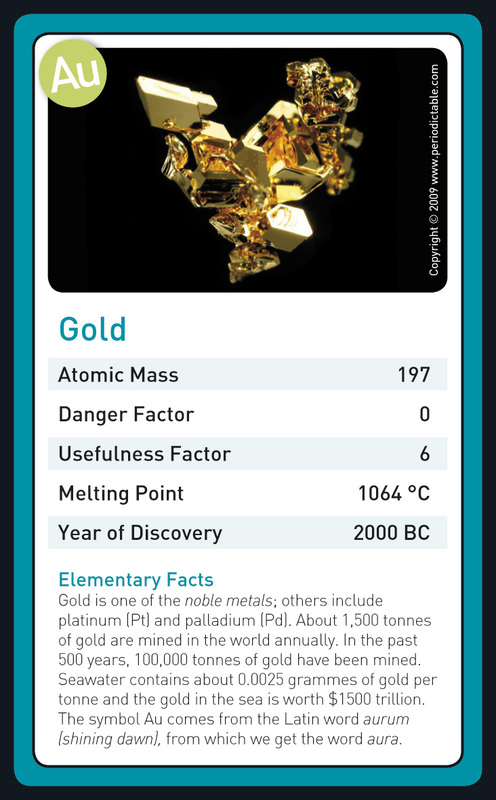 Each playing card has a picture of the relevant element either in its native form or in some type of application.The trump factors are Atomic Mass, Danger Factor, Usefulness Factor, Melting Point and Year of Discovery. 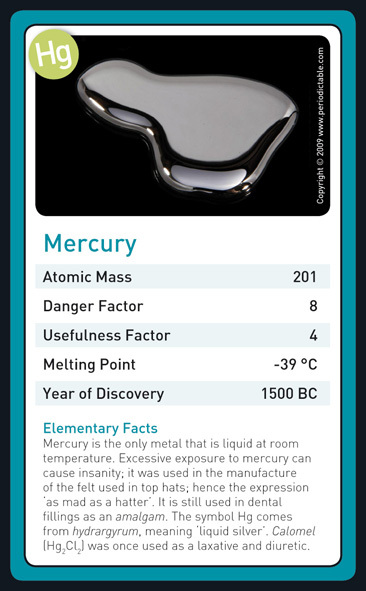 At the bottom of each card are some 'Elementary Facts', designed to give the player some insights into the element and provide takeaway knowledge. All the factors and the facts have been meticulously researched by Dr Hal and the research overseen by RGB Research Ltd. to ensure an excellent playing experience for participants, and the game is backed up by downloadable teacher’s notes. 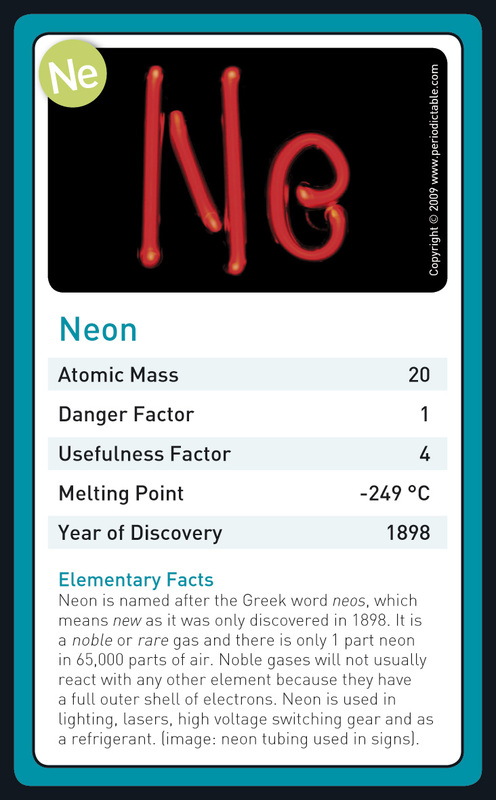 The element cards are: Hydrogen (H), Helium (He), Lithium (Li), Beryllium (Be), Boron (B), Carbon (C), Nitrogen (N), Oxygen (O), Fluorine (F), Neon (Ne), Sodium (Na), Magnesium (Mg), Aluminium (Al), Silicon (Si), Phosphorus (P), Sulphur (S), Chlorine (Cl), Argon (Ar), (Potassium (K), Calcium (Ca), Iron (Fe), Copper (Cu), Arsenic (As), Bromine (Br), Tin (Sn), Gold (Au), Mercury (Hg), Lead (Pb), Bismuth (Bi), Plutonium (Pu), Americium (Am), Fermium (Fm). 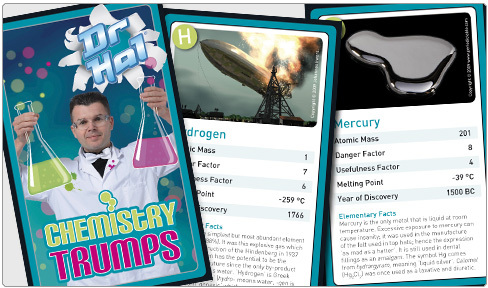 Dr Hal's Chemistry Trumps are an excellent tool for learning through play; we have run test groups of younger players and they have learned not only about the common elements, but also about the less common ones, and how to deal with, and compare negative numbers like low melting points and pre-AD Years of Discovery. Older players have benefited by learning new facts from the game and also by seeing unusual examples of application of elements, as well as learning new elementary facts. 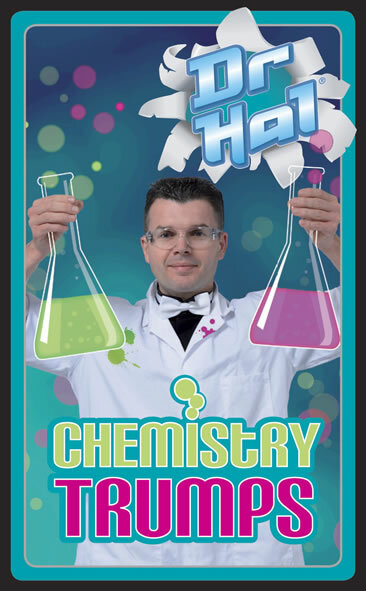 The game is suitable of all scholars of chemistry and maps directly onto the Key Stage 3 of the National Curriculum and is relevant and informative to all chemistry learners.